Nazmi Jubeh, PhD (b. Jerusalem, 1955) is associate professor of history and archaeology at Birzeit University in Palestine and was the Co-Director of Riwaq: Centre for Architectural Conservation in Ramallah (1992-2010). He also was the director of the Islamic Museum – al-Haram al-Sharif- Jerusalem (1980-1984). Jubeh’s research melds archeology, history, politics and architecture. He completed initial studies in Middle Eastern Studies and archaeology at Birzeit University and received both a Masters degree in oriental studies and archeology and a PhD in Oriental Studies from the University of Tubingen in Germany. Jubeh is known for his expertise on Jerusalem and Hebron in general and the holy sites in particular. Jubeh currently serves on the board of trustees of several cultural institutions and museums in Jerusalem and in the West Bank. He published several books and a number of articles on history, archaeology, politics and architecture. The following essay by Dr. Nazmi Jubeh is republished on Maydan in full with the same title. It first appeared in “Commentary: Jerusalem at Boiling Point,” an online supplement to Journal of Palestine Studies, Vol. 45, No.2 (Winter 2016). It appears on pp. 23-37 of that supplement. We would like to thank the author and the University of California Press for their permission to publish this important essay on Maydan and JPS for their editorial work on the article. The year 2000 witnessed a watershed moment in the conflict over control of Haram al-Sharif (the Noble Sanctuary), the larger compound in which the al-Aqsa Mosque and the Dome of the Rock are situated and which religious Jews identify as the Temple Mount. Ever since that year, increasingly aggressive Israeli policies in the area have become sanctioned at all levels, with little regard either for diplomacy or the notions of using the velvet glove rather than the iron fist to address the situation. Former prime minister Ariel Sharon’s provocative visit to the site on 28 September 2000 did not merely mark the start of the second intifada (known also as al-Aqsa intifada), which went on for five years. His action took place in a specific political context: Sharon was not going to the compound to worship or express a sentimental bond to the site as a Jewish individual but to signal Israel’s righteous claim to the area, ushering in almost two decades of increasing Israeli encroachment there. First, the Moroccan Quarter (Harat al-Maghariba) was razed to the ground to make way for a large open plaza in front of the Western Wall, which became the first symbolic Israeli space in East Jerusalem. Even though this was accomplished under the aegis of a secular Israeli government (primarily then-defense minister Moshe Dayan), the wall gradually became a central religious destination. Intertwined with its religious significance was the political symbolism it quickly accrued, becoming the place where every Israeli army recruit swore the oath of loyalty to the state and where election winners gave thanks. Once it became popular for political parties to seek the blessing of a rabbi, even secular politicians began visiting the site during their campaigns. However, by the end of this initial two-year phase after the 1967 occupation, members of the Israeli police and Border Police had slowly penetrated the grounds of the compound and taken control of a building in its northern wall, turning it into a permanent Israeli police headquarters. They did this in the name of protecting the Noble Sanctuary from Jewish attacks. They had also taken control of the Mamluk-era Tankaziyya School, located at the gate adjacent to the compound’s western wall and overlooking the Western Wall plaza, and also established a headquarters for the Border Police there (see figure 1). That is how an Israeli security presence came to encompass the entire compound. Even if this was not considered direct interference on the part of the Israeli state, such an intensive police presence marked a qualitative change in the management of Haram al-Sharif. Among the many challenges that it posed was determining who was actually in charge of the site. When a fire broke out at al-Aqsa Mosque in 1969, the Waqf accused the Israeli authorities of responsibility: whether with or without the knowledge of the Israeli forces who now controlled that entry point, the Australian arsonist, Denis Michael Rohan, had entered the compound through the Mughrabi Gate. Once the fire was raging, the authorities failed to put it out, provoking outrage not just among Palestinians, but among Arabs and Muslims in general. This incident exposed Israel’s true intentions early on, and it highlighted the very real dangers threatening the site. In response to the fire, the Waqf temporarily closed Haram al-Sharif to all visitors: the measure was not only cautionary, it was also an assertion of the Waqf’s control of the building. Less than a year after the fire, on 14 August 1970, former Israel Defense Forces (IDF) officer Gershon Salomon spearheaded a group of activists under the banner of the Temple Mount Faithful who stormed the compound with the goal of rebuilding what they described as the Third Temple. This led to violent clashes, in a pattern that continues to this day, especially at the height of Jewish commemorations of the historic destruction of the temple (on the ninth day of the Hebrew month of Av) in 70 c.e. On 19 April 1980, a semisecret conference of Jewish rabbis and scholars discussed ways to “liberate the Temple Mount from the Muslims.” On 4 August 1986, another group issued a “final ruling” stating that God permitted Jews to pray at the Temple Mount and calling for the construction of a synagogue in the mosque compound, a subject that had hitherto been off-limits among Jewish religious scholars. Israel’s highest court technically permits Jews to pray at the Temple Mount/Haram al-Sharif, invoking a Jewish right to do so. In practice, however, the High Court of Justice has ceded the enforcement of that ruling to the discretion of Israeli police, in accordance with the prevailing security climate. The court reaffirmed this stance on 25 July 1995 when it ruled that Israeli police could permit a group of Jews to pray inside the mosque on 21 August of that year (corresponding to the aforementioned 9 Av in the Hebrew calendar), once again precipitating clashes between Muslim worshippers and Jewish activists. The final decades of the twentieth century witnessed dozens of Israeli attacks and incursions at the site, official, popular, as well as religious. These ranged from opening fire within the Dome of the Rock, leading to the death or injury of over sixty Palestinians and physical damage to the building’s tile and plaster work in April 1982, to soldiers shooting at worshippers inside the compound, causing the death or injury of about one hundred Palestinians in May 1988. On 8 August 1990, another twenty-two Palestinians were killed and about two hundred others injured; and the list goes on. In the early 1980s, Israel began excavation work along the western wall of Haram al-Sharif, which the Waqf indicated was an explicit change in the status quo. It warned that the excavations would cause structural damage to a number of buildings of historical significance, including the entrance to the al-Manjakiyya School (which houses the Waqf’s headquarters). The resulting tunnel, which was subsequently opened in an official ceremony presided over by Prime Minister Benjamin Netanyahu on 25 September 1996, provoked a new wave of protests, in which dozens more Palestinians were killed and hundreds injured. Starting in July 1996, the Waqf backed and supported a series of popular initiatives to restore and renovate a large sixty-five hundred square meter hall beneath the al-Aqsa plaza, a space that is sometimes referred to as Solomon’s Stables. Located under the southeast corner of the plaza, its southern and eastern walls are contiguous with those of the Old City itself, and two city gates, which remain closed, lead directly into the space. Because the hall was connected to Haram al-Sharif only through a small gate less than a meter wide, the Waqf opened two large entryways into the space, which they named the Marwani Prayer Hall. Meanwhile, months-long excavation and tunnel work overseen by various Israeli departments and agencies had reached the southern walls. The Antiquities Authority, for example, reconstructed a wide staircase leading directly into the space. This provoked fears within the Waqf that an Israeli plan existed to take control of the area and convert it into a synagogue, which is precisely what had happened to other Waqf properties along the Western Wall, including several halls in what is known as the Western Wall Tunnel and recently the Mamluk hall discovered close to Hammam al-‘Ain next to Suq al-Qattanin (the Cotton Market) which is slated to be converted into a synagogue. While the excavations were criticized for being a politically partisan tool in some Israeli quarters, both secular and religious Israelis objected to the actions of the Waqf, which was accused of destroying temple artifacts and altering the status quo. The Waqf, for its part, deemed its ownership rights to all parts of the compound to include the right to carry out necessary restoration and renovation work. As the number of worshippers at al-Aqsa Mosque had steadily increased over the years, additional space was needed to accommodate the faithful, particularly over Ramadan and in inclement weather (extreme summer heat and strong winter rains). The Waqf therefore argued that its project was in response to a pressing need and that no artifacts existed to its knowledge. Nevertheless, the renovation of the Marwani Prayer Hall constituted a turning point in the Israeli state’s attitude to the site. In 1967, right after the occupation of Jerusalem, Israel passed the Protection of Holy Places Law stipulating that “the Holy Places shall be protected from desecration and any other violation.” It was this law that the Temple Mount Faithful invoked in 1996 to allege that unlicensed and destructive archaeological work had taken place in Solomon’s Stables, which they claimed to be inseparable from what they regarded as the Temple Mount. While the High Court of Justice rejected their allegations on 16 October of that year, partly because the Israel Antiquities Authority had reported no such destructive acts, the court emphasized the need for extreme caution owing to the site’s religious and political sensitivity. Other Israeli laws pertain to Haram al-Sharif, notably the Planning and Building Law of 1965 and the Antiquities Law. In August 1967, the Israeli authorities declared the compound, which they now named the Temple Mount, an archaeological site (although it should be noted here that neither the British nor the Jordanian antiquities laws hitherto in effect had included Jerusalem’s holy sites). On 11 January 2000, the High Court of Justice ruled on a joint petition from the mayor of Jerusalem and the head of the Antiquities Authority calling for a cessation of excavation and restoration in Solomon’s Stables, which invoked the site’s uniqueness and its extreme sensitivity. Despite recognizing that these activities violated both the Antiquities Law and the Planning and Building Law, the court rejected the petition. 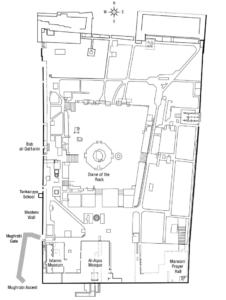 The position of the Waqf was, and remains, that Haram al-Sharif, comprised of all its structures, memorials, and grounds, and all that lies beneath them, as well as its walls and gateways, is an exclusively Islamic possession as acknowledged by successive rulers of Palestine ever since the seventh-century Arab-Islamic conquest (and most recently in modern history, the Ottoman Empire, the British Mandate, and Jordan). From an administrative standpoint, however, it is the Hashemite Kingdom of Jordan that has been the acknowledged administrator of the compound since 1967––despite Jordan’s decision to break administrative ties with the West Bank. Jordan never transferred administration of the Waqf to the Palestinian Authority (PA) when the latter was created in the wake of the Oslo agreements, and it continues to pay the salaries of Waqf employees to this day. By doing so, it has effectively prevented Israel from taking over the site as has been the case with many other historical buildings in Jerusalem. In the two decades that followed the 1967 war and the Israeli takeover of Jerusalem, visits by Jews to sanctuary had posed no problem, in spite of periodic attacks that were invariably considered isolated incidents (for example, the 1969 arson attack on al-Aqsa Mosque). Problems began only after ultrareligious Jewish nationalist groups began calling for the destruction of the mosque and the construction of a Jewish temple in its place. Even though such pronouncements were not a direct threat and the Waqf took no steps to close the mosque to Jewish visitors, once Israel’s political establishment (as illustrated by the Sharon visit) endorsed the ultranationalist position, the sanctuary came to occupy center stage in the conflict over occupied Jerusalem. With continuing excavations and incessant settlement activity nearby, Sharon’s September 2000 visit to the site was the first signal that Haram al-Sharif was in serious and imminent danger. In the last three years, visits by Jews to the site have lost any aspect of pilgrimage and are clearly aimed at provoking a Muslim backlash. Visitors have not only attempted to pray at the site and issued statements hostile to the mosque’s very existence, but both Israeli government ministers and members of the Knesset (MKs), who have made repeated visits to the site, have issued incendiary statements about the future of Haram al-Sharif and the right of Jews to return to what they term the Temple Mount. In many cases, religious rulings handed down by rabbis have endorsed such positions, further buttressing the politicians’ visits. Over the years, there have emerged dedicated groups with ties to the government that are responsible for coordinating such visits, which now occur multiple times a day in order to create the impression of a continuous Jewish presence at the site. 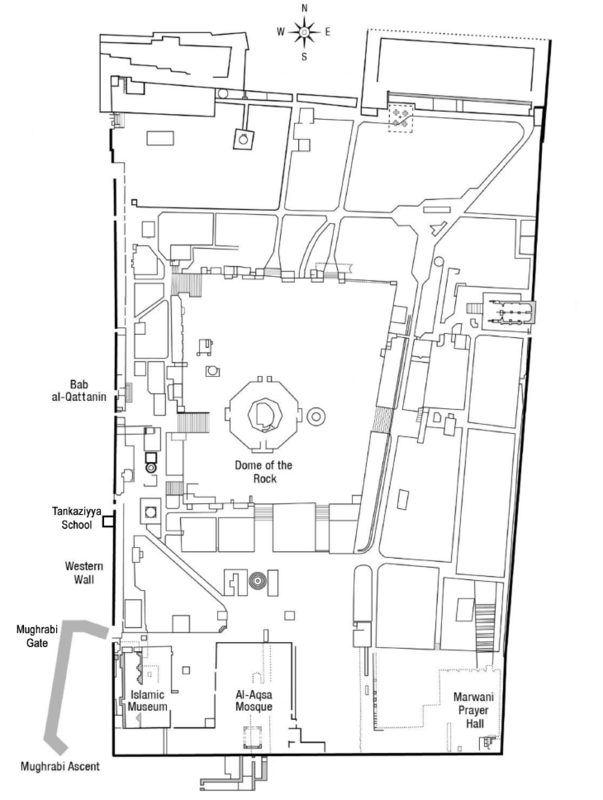 In 2001, Israel announced that the open grounds of Haram al-Sharif would henceforth be designated national parks, meaning that they would be open to all visitors and implying that the Waqf had no authority over those areas besides cleaning them––effectively limiting its purview to roofed structures. This of course flies in the face of the historically recognized status quo, according to which Waqf authority extends over all 144 dunams of the entire compound, including its outer walls, the structures on its grounds, as well as open courtyards, gardens, and buildings overlooking the western and northern sides of the compound, all of which form an Islamic waqf or endowment in the true sense of the term. For years now, Haram al-Sharif has been subject to harsh Israeli control that extends to everything that happens there: who may enter, when, and through which gate or entryway. Israel dictates the age of Muslim worshippers who may enter, bans large groups from the mosque, and forbids prayer inside the mosque at particular periods of the year. In addition to the restrictions placed on the mosque’s Palestinian guards, the Waqf is not allowed to bring anything into the mosque––whether books, computers, or even a bag of cement––without permission from the Israeli police, who act as though they unilaterally control the site. Added to all this is the continued presence of police and Border Police bristling with weapons posted at both the entrance to the mosque and on its grounds. On 5 November 2014, in an unprecedented attack on the mosque, Israeli police set off smoke bombs, tear gas, and stun grenades inside the building, destroying parts of the mosque and igniting outrage. To make matters worse, Israel appears unable to understand how such incidents affect Palestinians (and Arabs in general), whose feelings it openly disregards. There is a strong correlation between what is happening in Jerusalem as a whole and what is happening at Haram al-Sharif, and as long as Israel insists upon its current policies, confrontations at the site will continue. Nevertheless, some Israelis have raised their voices to call for the Temple Mount groups to be reined in and for MKs and cabinet ministers to be prevented from using the site for political ends. This was particularly the case in the wake of the attempted assassination in October 2014 of Yehuda Glick, the extreme right-wing activist and rabbi, and of the deadly attack on a synagogue in the Har Nof settlement the following month. After coming under pressure from the European Union and the United States, both of which took a more robust stance than usual, Netanyahu added his voice to the chorus calling for de-escalation. The day after the 5 November attack on the mosque, Amman withdrew its ambassador from Tel Aviv in protest and lodged a complaint with the United Nations Security Council. Jordanian responsibilities at Haram al-Sharif are regulated by the Wadi Araba Agreement, the 1994 peace treaty between Israel and Jordan. Article 9.2 of the agreement specifies that “in accordance with the Washington Declaration, Israel respects the present special role of the Hashemite Kingdom of Jordan in Muslim holy shrines in Jerusalem. When negotiations on the permanent status take place, Israel will give high priority to Jordan’s historic role in these shrines.” Jordan’s position has been further bolstered by the guardianship agreement signed by Palestinian president Mahmoud Abbas and King Abdullah of Jordan in March 2013, explicitly entrusting Jordan with the protection of Jerusalem’s holy sites. Jerusalem has been in the news for over a year. Since the murder of teenager Mohammed Abu Khdeir on 2 July 2014, acts of resistance to the occupation have spread throughout the city and these have been met with brutal repression, including mass arrests and the widespread detention of Palestinian children under the age of ten. Ongoing and escalating arrests affect every segment of the population, including the female guardians of the compound, youth leaders, the families of activists, and minors. In the two months of November and December alone, hundreds of Palestinians have been detained in East Jerusalem, the majority of them under the age of eighteen. There has been extensive footage aired on local television channels of the repressive tactics used by the Israeli security apparatus especially targeting youth and children, including solitary confinement, torture, various forms of harassment, and extrajudicial killings. Yet despite convening a number of political and security meetings to that end, the Israeli occupation apparatus is unable to bring East Jerusalem to heel. It has violated international law, firing live rounds at protesters letting off firecrackers, for example; the crisis is the subject of nonstop discussion in the Israeli media, as if what was happening was somehow surprising; and the media discussions have included talk of new means of repression being considered by the authorities, with several Israeli leaders threatening East Jerusalem’s population with collective punishment (also a crime under international law). Collective punishment is already a tangible reality in the greatly accelerated rate of demolitions, of both unregistered homes and the homes of militant activists involved in resistance operations inside the city; collective punishment is also evidenced in the arrest of stone-throwing children and the tightening of already stringent restrictions on movement between Jerusalem and the West Bank, a harrowing journey that has become even more humiliating than it used to be for some one hundred thousand Jerusalemites who commute daily. In addition, the Finance Ministry and the municipality have enforced a fierce tax crackdown, with the latter revoking Jerusalemites’ identity cards thereby denying them the natural, human right to live in their city, and that of their fathers and grandfathers. Not to mention the police that has taken to harassing Jerusalemites for the most trivial reasons––and sometimes for no reason at all. Just before Ramadan, which corresponded with July of 2015, Jordan and Israel reached a series of understandings regulating issues of contention at Haram al-Sharif (see “Jerusalem and the Temple Mount” in Settlement Monitor, JPS 45). Accordingly, Israel agreed to: eliminate age restrictions on Muslim worshippers; stop the harassment of Palestinian murabitun and murabitat (male and female guardians of the site); end the practice of confiscating women’s identity cards; prohibit the display of Israeli political symbols within the grounds; and curtail the release of statements about the future of the site from both politicians and settler organizations. For a brief few weeks afterward, life returned to normal. But matters soon reverted to their previous state and in fact worsened, once Ramadan was over and Israel stopped enforcing the measures to which it had agreed. Incursions into the compound resumed, with right-wing Israeli politicians making inflammatory statements, once again turning Haram al-Sharif into a partisan issue. Work also resumed on the tunnels being dug near the mosque, as well as construction on more synagogues nearby. While the causes of the mass revolt that soon followed in the occupied territories are beyond the scope of this discussion, it is appropriate here to examine Haram al-Sharif’s central place in the ongoing events. It was after all continued Israeli violations of the status quo there that ignited the spark in Jerusalem that eventually spread to Palestinian territories on both sides of the Green Line. Following the intervention of U.S. secretary of state John Kerry in October 2015, Israel and Jordan reached yet another set of understandings. Regardless of their effectiveness in terms of calming tensions (as many hope), it is worth considering the agreement’s key stipulations and their long-term implications for Haram al-Sharif. Second is the issue of video surveillance. The agreement reached in October 2015 stipulated that cameras, under the full control of the Waqf, were to be installed to monitor Haram al-Sharif’s external spaces. According to the Jordanian king, these would link directly to the Hashemite palace in Amman. It should be noted that Israeli surveillance cameras have been monitoring the grounds of the compound for years now. Some are mounted on the roof of the Tankaziyya School, some on the western wall of compound, and others on the Mount of Olives. The Israelis monitor everything that happens on the grounds but this surveillance has only ever been used against Palestinians, and never to document Israeli encroachments. The proposed cameras will presumably also record what have been daily Israeli incursions into the compound. Third is the right of Muslims to pray at Haram al-Sharif and of Jews to visit the site. The Waqf has never opposed the principle of visitors entering the site, and the Dome of the Rock and the prayer hall of al-Aqsa Mosque have been open to visitors of all religious and national origins. But this was not considered a right: the right is properly that of the Waqf, which as the site’s owner is entitled to determine who is welcome there. The reality, however, is that the Waqf is no longer able to rule on this matter (as for example in the instance of provocateurs with a history of provoking or attacking worshippers) leaving Israel to interpret this new reality as a revocation of the Waqf’s right to close the site if it is threatened. One could therefore conclude that one of Netanyahu’s achievements with the latest understanding has been to secure the right of Jews to visit, as opposed to what hitherto had been a privilege granted by the Waqf. While this right could, in practice, be revoked, it is now codified that the Waqf must honor it. Meanwhile, Israel has created a blacklist, particularly targeting the murabitat, who have been banned from entering the mosque since September 2015, and it has periodically forbidden large numbers of Palestinians from worshipping there for various lengths of time. In other words, Israel has taken upon itself the task of defining the right to visit. The upside may be that the “right to visit” does not mean the right to pray or worship. It is also worth noting that Netanyahu has ordered ministers and MKs not to enter Haram al-Sharif––although he took the opportunity to also ban Arab MKs, thereby equating a staunch defender of Haram al-Sharif, MK Ahmad Tibi, with the racist Naftali Bennett, a senior cabinet minister and leader of the right-wing Jewish Home Party that is committed to replacing the mosque with the Third Temple. Still, so long as this remains a volatile issue with the potential for fatal violence, any achievement on this front cannot be understated. It may be too soon to pass judgment on the latest set of understandings between Jordan and Israel, and how they will affect Haram al-Sharif, whether positively or negatively. But they have certainly not diminished the resolve of the Palestinian people to rise up at the mere mention of the holy site when they see it being threatened. The PA, for its part, maintains a vague stance and it has withheld from issuing a public statement on the agreement. There is no evidence that Abdullah or Kerry coordinated with the PA on the matter, and articles in the Arabic-language press suggest that the agreement drawn up under Kerry’s aegis strained the already sensitive relationship between the PA and Jordan to the point of crisis. The Islamic Movement inside the Green Line, which is active in the struggle for the protection of Haram al-Sharif, has described the agreement as “throwing sand in our eyes” while Hamas has depicted it as “feeble and devoid of content.” For its part, Jerusalem’s Higher Islamic Council (al-hay’a al-islamiyya al-‘uliya) has strongly criticized the agreement, rejecting the assertion that it guarantees the right of Muslims to pray, invoking the argument that Muslims do not need permission from anyone to pray at Haram al-Sharif. It also pointed out that Kerry used the term Temple Mount to refer to a site whose only name, the organization emphasized, is al-Aqsa Mosque. Jerusalem-based civil society organizations have been more diplomatic, merely asking for the agreement to be revised. Has Haram al-Sharif become the last Palestinian refuge in Jerusalem to be commandeered by Israel? Is this iconic landmark, which perches on the edge of the city and dominates its skyline, doomed? As things stand at this writing, the repeated aggressions against Haram al-Sharif have brought the city to the brink of explosion. But the matter will not be resolved by the Kerry agreement, only temporarily deferred, because the problem is not Haram al-Sharif––it is the occupation itself. In order to have any chance of success, an agreement addressing the issue of Jerusalem’s holy places must focus on ending the occupation, not merely on improving the occupier’s image. The fact is that what is now tantamount to an open-ended onslaught on Haram al-Sharif is part of the much broader fate of the Old City and its surroundings, what Israel calls the Holy Basin. The wider context encompasses the incremental and now relentless Judaization of Jerusalem, erasing the city’s cultural identity and its historical narrative whether by the erection of museums and archaeological excavations, the expulsion of its Palestinian population, or the marginalization, if not erasure, of the city’s Palestinian religious and cultural symbols. Its significance notwithstanding, the site alone cannot explain the current state of affairs. Jerusalem has been aflame for over a year, exposing a racist, apartheid system whose tools have been decades in the making. The myth of a united Jerusalem has been debunked—not only have the occupation authorities isolated Jerusalem from the West Bank with the so-called separation wall and the ever-expanding settlements, they have separated East Jerusalem from West Jerusalem with a myriad of checkpoints and fences and concrete barriers. Jerusalem is, de facto, divided, something both right- and left-wing Israeli parties have blamed on Netanyahu and the policies of successive settler-friendly governments. On the other side, the latest popular revolt throughout the occupied territories has also brought into focus the deep division of the city, while simultaneously demonstrating the utter failure of Israel’s attempts to swallow up Jerusalem over the past five decades. At the time, Sharon was the opposition leader in the Knesset. During his visit he was accompanied by a delegation of other MKs from the Likud Party. They were guarded by hundreds of members of the police force, Border Police, and special forces. At the time, the author of this article along with the late Faisal Husseini and several dozen Palestinian youths attempted to obstruct the incursion. Sharon was quickly removed from the al-Aqsa courtyard as dozens of youth threw stones at Israeli security forces. Unable to complete his visit, he fled the site. The following day protests and demonstrations started in the courtyard of the mosque following Friday prayers and three protesters were killed and dozens injured after Israeli security forces opened fire. Shortly afterward, the protests spread to the rest of the occupied Palestinian territories and the second intifada, also known as the al-Aqsa intifada, began. See Ahmad Qurie (‘Abu Ala’), Peace Negotiations in Palestine: From the Second Intifada to the Roadmap (London: I.B. Tauris, 2015), p. 11ff. Sharon himself stated, “The Temple Mount is in our hands and will remain in our hands. It is the holiest site in Judaism and it is the right of every Jew to visit the Temple Mount.” Suzanne Goldenberg, “Rioting as Sharon Visits Islam Holy Site,” Guardian, 28 September 2000, http://www.theguardian.com/world/2000/sep/29/israel. Tom Abowd, “The Moroccan Quarter: A History of the Present,” Jerusalem Quarterly 7 (Winter 2000), pp. 6–16. See U.S. Department of State, “Israel and the Occupied Territories,” 2014 Report on International Religious Freedom, 14 October 2015, http://www.state.gov/j/drl/rls/irf/religiousfreedom/index.htm?year=2014&dlid=238458. For more details on the group’s objectives, see its website. “Objectives of the Temple Mount Faithful,” Temple Mount & Land of Israel Faithful Movement, http://templemountfaithful.org/objectives.php. For details, see Motti Inbari, Jewish Fundamentalism and the Temple Mount: Who Will Build the Third Temple? (Albany: State University of New York Press, 2009), pp. 79ff. 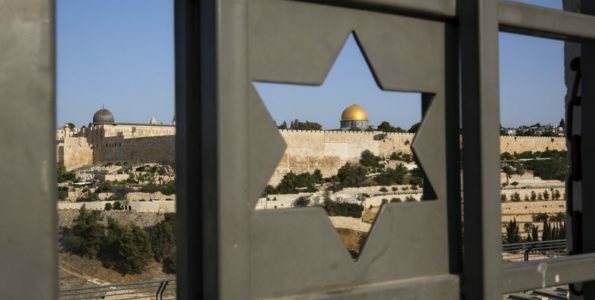 “Jerusalem Court: Jews Can Pray on Temple Mount,” Israel Today, 15 March 2015, http://www.israeltoday.co.il/NewsItem/tabid/178/nid/26240/Default.aspx. Attack by IDF soldier Alan Goodman on 11 April 1982. See Ann LoLordo, “Israel Releases Baltimorean Who Killed at Mosque: Goodman Received Life Term in Attack at Jerusalem Shrine,” Baltimore Sun, 27 October 1997, http://articles.baltimoresun.com/1997-10-27/news/1997300005_1_temple-mount-goodman-jerusalem. Adnan al-Husayni, “Adwa’ ‘ala qadiyat fatah al-nafaq,” Majalla shu‘un tanmawiyya 6, no. 1–2, (Jerusalem: Al-multaqa al-fikri al-‘arabi, 1996–97). The Hashemite Kingdom of Jordan and the State of Palestine, Status Report on the State of Conservation of the Old City of Jerusalem and Its Walls, presented to the UNESCO World Heritage Center, 16 March 2015, p. 18, whc.unesco.org/document/135357. Aaron Klein, “Muslims Caught Red-Handed Destroying Temple Artifacts,” WorldNetDaily, 2 September 2007, http://www.wnd.com/2007/09/43330/. “Basic Laws of Israel: Protection of Holy Places Law (1967),” Jewish Virtual Library, http://www.jewishvirtuallibrary.org/jsource/Politics/Other_Law_Holy_Places.html. The court also emphasized that the 1967 law abrogated the earlier 1924 law on the same subject and that it would supersede it should the two be found to contradict one another. Israel’s Antiquities Law was originally based on the Antiquities Ordinance of the British Mandate period, with substantial revisions made in 1960, 1978, and 1989. Of the movements that organize visits to the site, twenty-two are officially registered with the Israeli registry of associations, and all operate with the government’s blessing: some receive direct, and others indirect, governmental financial support. 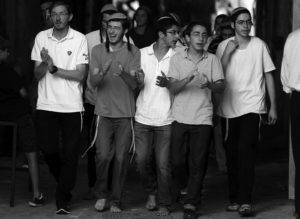 There are also ten unregistered organizations, as well as a list of rabbis who have issued religious rulings on the permissibility and necessity of performing Jewish religious rites in the compound. These movements have penetrated the educational system, and they enjoy a relationship with numerous Knesset members. See Yizhar Be’er, Dangerous Liaison: The Dynamics of the Rise of the Temple Movements and Their Implications, trans. Shoshana London Sappir (Jerusalem: Ir Amim/Keshev, 1 March 2013), pp. 17ff, http://www.ir-amim.org.il/sites/default/files/Dangerous%20Liaison_0.pdf. International Crisis Group, The Status of the Status Quo at Jerusalem’s Holy Esplanade, Middle East Report no. 159, (Brussels: International Crisis Group, 30 June 2015), pp. 15-16, http://www.crisisgroup.org/~/media/Files/Middle%20East%20North%20Africa/Israel%20Palestine/159-the-status-of-the-status-quo-at-jerusalem-s-holy-esplanade.pdf. “Israeli Occupation Forces Storm al-Aqsa Mosque,” Middle East Monitor, 5 November 2014, https://www.middleeastmonitor.com/news/middle-east/15097-israeli-occupation-forces-storm-al-aqsa-mosque?fb_comment_id=803531963022381_803700166338894#f2eecb603. For more on the various Jewish temple groups and their platforms, see Be’er, Dangerous Liaison, 2013; International Crisis Group, The Status of the Status Quo, 2015. Ali Abunimah, “Who Shot Yehuda Glick?,” Electronic Intifada, 30 October 2014, https://electronicintifada.net/blogs/ali-abunimah/who-shot-yehuda-glick. Peter Beaumont, “Five Israelis Killed in Deadly Attack on Jerusalem Synagogue,” Guardian, 18 November 2014, http://www.theguardian.com/world/2014/nov/18/deadly-attack-in-jerusalem-synagogue. A European document leaked to the Israeli daily Haaretz made mention of “red lines” in reference to Israeli settlements in and around Jerusalem. For more, see Barak Ravid, “EU Seeks Talks with Israel over Red Lines in West Bank,” Haaretz, 22 October 2014, http://www.haaretz.com/israel-news/1.622099. It would appear that the document, which included language about not upsetting the status quo at Haram al-Sharif, might have been created after Israel announced its seizure of 4,000 dunams of land west of Bethlehem for the purpose of expanding the Gush Etzion settlement bloc. The document indicated that construction there and in Givat Hamatos would jeopardize the possibility of a contiguous Palestinian state, effectively prejudicing the possibility of a two-state solution. That notwithstanding, the large settlement bloc was eventually built. Suleiman Al-Khalidi, “Jordan Recalls Envoy to Israel over Jerusalem ‘Violations,’” Reuters, 5 November 2014, http://www.reuters.com/article/us-mideast-jordan-israel-idUSKBN0IP1HZ20141105. Treaty of Peace between the State of Israel and the Hashemite Kingdom of Jordan, Israel-Jordan Peace Treaty, Israel Ministry of Foreign Affairs, 26 October 1994, http://www.mfa.gov.il/mfa/foreignpolicy/peace/guide/pages/israel-jordan%20peace%20treaty.aspx. For more, see “Jordan, Palestine Sign ‘Historic’ Agreement to Protect al Aqsa,” Jordan Times, 31 March 2013, http://www.jordantimes.com/news/local/jordan-palestine-sign-historic%E2%80%99-agreement-protect-al-aqsa. On the murder and the immediate response, which swept through the neighborhoods of Jerusalem, see Ian Deitch, “Suspects Confess to Murdering Palestinian Teen Whose Charred Body Was Found in Jerusalem, Israel Says,” National Post, 7 July 2014, http://news.nationalpost.com/news/world/israel-middle-east/suspects-confess-to-murdering-palestinian-teen-whose-charred-body-was-found-in-jerusalem-israel-says. https://www.middleeastmonitor.com/news/middle-east/21221-israeli-forces-arrest-four-children-in-east-jerusalem; Ylenia Gostoni, “Oz: Israel’s Prison for Palestinian Children,” Al Jazeera, 28 October 1985, http://www.aljazeera.com/news/2015/10/oz-israel-prison-palestinian-children-151027102958151.html. For example, see Elisa Tappeiner, “Arrest and Abuse by Israeli Police Part of Life for Children in Silwan,” Defense for Children International–Palestine, 22 February 2014, http://www.dci-palestine.org/arrest_and_abuse_by_israeli_police_part_of_life_for_children_in_silwan. Mel Frykberg, “Bringing into Question Israel’s Extrajudicial Killings,” Al Jazeera, 21 October 2015, http://www.aljazeera.com/news/2015/10/bringing-question-palestine-israel-extra-judicial-killings-151012070120570.html. Ali Abunimah, “Video: Israeli Occupation Forces Attack Elderly Man Protecting Jerusalem’s al-Aqsa,” Electronic Intifada, 27 October 2014, https://electronicintifada.net/blogs/ali-abunimah/video-israeli-occupation-forces-attack-elderly-man-protecting-jerusalems-al-aqsa. “The Temple Mount/Haram al-Sharif: Threats to the Status Quo,” December 2014 supplement, no. 3, to Be’er, Dangerous Liaison, http://www.ir-amim.org.il/sites/default/files/Dangerous%20Liaison%20Supplement%203.pdf. For more details, see “Israel, Jordan Agree on Steps to Ease Tensions at Holy Site in Jerusalem,” Japan Times, 25 October 2015, http://www.japantimes.co.jp/news/2015/10/25/world/israel-jordan-agree-steps-ease-tensions-holy-site-jerusalem/#.Vsme-Pl97IU. The king’s remarks can be seen here: “Jalalat al-malik yaltaqi wafdan damma mumithalin ‘an awqaf al-quds wa shakhsiyat muqdissiya” [in Arabic], YouTube video, 13:17, JRTV Channel, 4 November 2015, https://www.youtube.com/watch?v=x-uDsACwSM8. It is also my personal opinion that Israel will find a way to tap into these cameras and the feed they broadcast to Amman, as they will be installed within an electromagnetic field controlled by Israel. Nazmi al-Jubeh, “1917 to the Present: Basic Changes, but Not Dramatic; Al-Haram al-Sharif in the Aftermath of 1967,” in Where Heaven and Earth Meet: Jerusalem’s Sacred Esplanade, ed. Oleg Grabar and Benjamin Z. Kedar (Austin: University of Texas Press, 2009), pp. 275–89. Oraib al-Rantawi, “’An ‘tafahumat Kerry’ wa ma ba’daha” [in Arabic], Ad-Dustour, 26 October 2015, republished by Al-Quds Center for Political Studies, at http://oraib.alqudscenter.org/arabic/article/9477#.Vl5Hgt-rSRt. “Israel Blacklists 40 Palestinian Women from entering Al-Aqsa Mosque,” Ma’an News Agency, 3 September 2015, https://www.maannews.com/Content.aspx?id=767412. “Rabbis Plan to Build Temple on Al-Aqsa Ruins,” Middle East Monitor, 22 December 2014, https://www.middleeastmonitor.com/news/middle-east/15922-rabbis-plan-to-build-temple-on-al-aqsa-ruins; and Ilan Pappé, “Destruction of al-Aqsa Is No Conspiracy Theory,” Electronic Intifada, 10 November 2015, https://electronicintifada.net/content/destruction-al-aqsa-no-conspiracy-theory/14991. Jeffrey Heller and Suleiman Al-Khalidi, “Jordan-Israel Relations in Crisis over al-Aqsa Mosque Strife,” Reuters, 5 November 2015, http://www.reuters.com/article/us-mideast-palestinians-israel-idUSKBN0IP0OV20141105. Khalil Kandil, “Tafahumat Kerry: Sharra’na intihak al-aqsa wa muhawalah liwaqf al-intifada,” [in Arabic] Albasheer, 26 October 2015, http://www.islamtoday.net/albasheer/artshow-13-216629.htm. For the contents of their statement, see ”Al-hay’al ‘ulya tu’akid rafdaha liltafahumat al-urduniyya al-israiliyya” [in Arabic], alShabiba, 2 November 2015, http://www.shabiba.com/article/106526. “Jerusalem Civil Society Organizations Urge the Reconsideration of the Jordanian-Israeli Understandings on al-Aqsa” [in Arabic], Talafisiyun al-fajr al-jadid, 9 November 2015, http://www.alfajertv.com/ticker/3938576.html. Nazmi Jubeh, “Jerusalem: Five Decades of Subjection and Marginalization,” Jerusalem Quarterly 62, (2015): p. 3–28.